Are you a first time guest at Bailey Baptist Church? Welcome! Is this your first visit to Bailey Baptist Church? We want you to feel welcome when you attend services with us. Our church feels like family. Expect a warm welcome in Sunday School and worship. Many people dress business casual but you will not be turned away if you are wearing jeans and t-shirt. Our worship style is blended meaning that we sing both traditional hymns and contemporary praise songs. 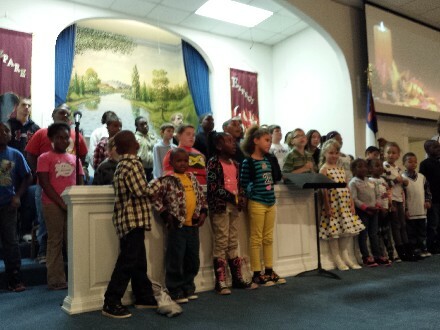 Our choir usually sings a special song and children from preschool to first grade are invited to attend our children's church service which is especially geared toward them. Our pastor preaches Bible based messages designed to help listeners grow deeper in their faith in God. Finally, a special time of invitation takes place in every service where people can make commitments to Christ, join our congregation, or simply pray at the altar. If you have any specific questions, email pastor Darrel at pastordarrel (at) welovebailey dot com.